Keep your closest companion warm and comfortable in cool weather with the Coleman Reversible Fleece Jacket. With plaid on one side and highly visible color on the other - this stylish piece delivers two coats in one. Adorable, trendy and reversible dog fleece jacket with plaid on one side, solid color on the other. 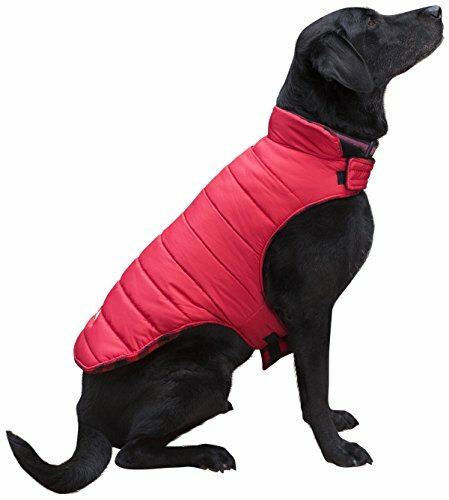 Water Resistant, keep your pup dry and warm with a durable nylon shell. Simple and Easy velcro strap closure - spend more time choosing between the snappy plaid or fuzzy solid side than you do putting it on. Multiple Sizes, this fleece jacket is available in several sizes to provide the perfect fit for any puppy or larger breed dog; Please Reference the Variations for all Available Size & Colors! Coleman is a name you can trust for premium dog clothing, toys and accessories. Stop by Our Storefront to See the Rest of Our Great Deals! Dogs are Wearing Size X-Large - 22.5"